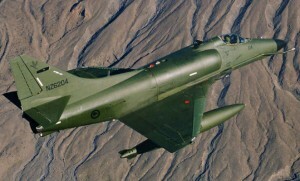 New Zealand Defence Minister Wayne Mapp has announced that nine of the Royal New Zealand Air Force’s (RNZAF’s) 17 mothballed A-4K Skyhawks will be earmarked for museums (including one for Australia), after a long running attempt to sell the aircraft failed. “The government has made every effort to sell the Skyhawk fleet but no acceptable offers have been received. We will therefore offer eight of them to qualifying public museums in New Zealand and one to Australia, for heritage and display purposes,” Mapp said in a statement. Mapp said that the remaining five aircraft would be “allocated on long term loan to other qualifying aviation museums in New Zealand,” with negotiations already underway. Meanwhile, the New Zealand government is continuing negotiations with Blenheim based Safe Air to sell it Skyhawk tooling and equipment, allowing the company to continue refurbishing Skyhawk J52 engines for international customers. Retired in December 2001, the RNZAF’s Skyhawk fleet was placed in storage at RNZAF Woodbourne. A 2005 NZ$150 million deal to sell the aircraft together with 17 MB-339 Macchi jet trainers to US based Tactical Air Services failed to materialise. “For years there were unrealistic expectations about the value of these aircraft. As a result, they have languished at Woodbourne for a decade. Today’s announcement marks an end to uncertainty and is welcome news for aviation enthusiasts throughout New Zealand,” Mapp said. The one for Nowra will most likely go back to its old RAN colours. How about one flying example for Temora?? Dejavue the RAAF C130A and RAN S2E/G dissposal debacles some years ago. Why don’t the Kiwi’s donate the ballance to other museums as well? Perhaps RMIT University and Kangan TAFE could use one each for trade and engineering training. “For years there were unrealistic expectations about the value of these aircraft.” This is what you get when you let commercialy incompetent and inexperienced career public servants cut deals on behalf of the tax payer. The dissposal task should have been hived off totaly to a commercial third party to realise market value, what ever that was at the time, and keep government fungers right out of the process. The NZ taxpayers could have realised some return. Instead they will now realise nothing, save for some, albeit wortwhile, museum pieces. I’m told most of the US A-4s which were stored at AMARC were scrapped because there were so many precious metals in them. I wonder if that option was ruled out for political reasons? What is the future for the Macchi’s??? Great to see that Nowra will be getting one of the Aircraft. It will be interesting to see the condition it is in? ?